I've made a bit of progress on my HST quilt. I'm about 1/2 done sewing the blocks. I also put together two more blocks for my wonky log cabin quilt. We have dubbed this quilt the World of Goo Quilt. 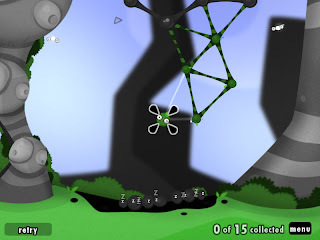 World of Goo is a computer game that the hubs and I got addicted to a few years ago. It's a fun game, but the graphics for the levels can be pretty crazy. As soon as the hubs saw the first block he said it reminded him of the game. Here are a couple screen shots from the game to give you an idea. I'm getting back into the swing of things as far as sewing is concerned. I have lots of new ideas floating around my head. It's nice to feel in the groove again. I missed it. My husband and I got hooked on World of Goo for Wii and I think it's great that that's what the quilt got nick-named! I also LOVE the wonky log cabins you have. I think you might be kick starting me to get moving on my quilt like that. Love both of those quilts. The Wonky Log Cabins are really awesome! The colors are great and very striking. That's too funny, the world of goo quilt! I will have to tell my husband about that game, it looks right up his alley. I really love those HSTs - is that Central Park? I love the colors. And those wonky neutral blocks are gorgeous. Just gorgeous! Your quilts look great! I really like the colors in your wonky log cabins. 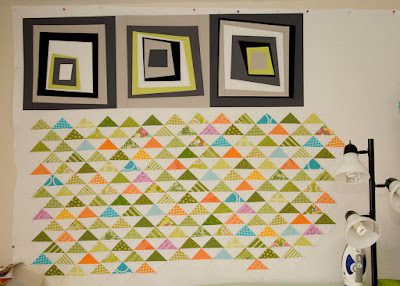 The HST quilt is similar to the one I am finishing up and I love the colors you picked! I laugh. . "I'm getting back into the swing of things as far as sewing is concerned" that's like the understatement of 2011. As far as I can tell you got your groove n' a bag o chips!! Beautiful projects, as always! Love the colors in your HST quilt. I'm so glad you got your groove back! Although, like sukie, I couldn't tell you ever lost it. 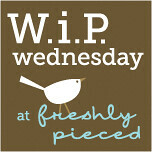 : ) Thanks for linking up with WIP Wednesday, have a wonderful week. 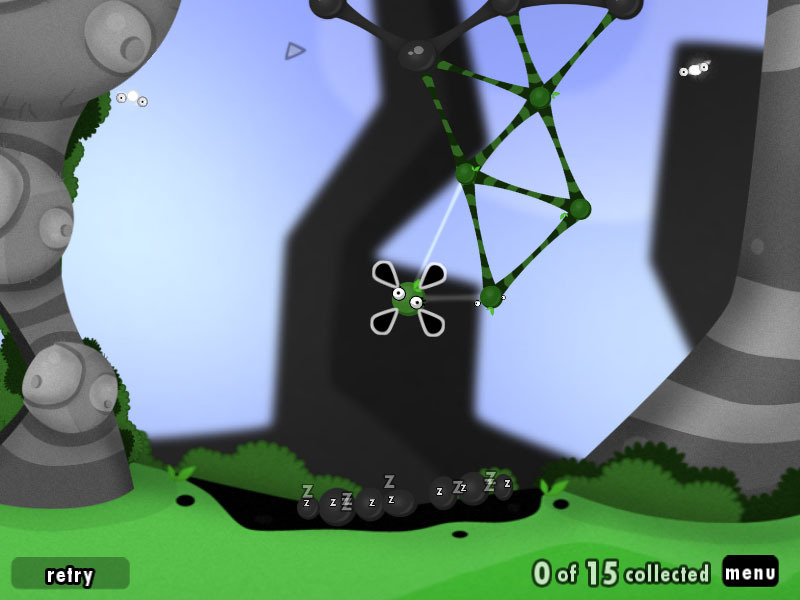 We love world of goo too. My oldest child is very enthralled by it and plays it on the Wii a lot. those HSTs are so pretty. :) And I love the Goo quilt! hilarious! I love how HSTs look, especially paired with white. World of Goo Quilt is coming along nicely, too! Welcome back - it's nice to get refreshed, isn't it? I really like the look of your HST quilt! So much detail! And the world of goo reference cracked me up, but seriously there is a resemblance! Lov'n the HST's.... The colors just get better and better as you add more. Love your HST quilt! That will be beautiful once it's finished! 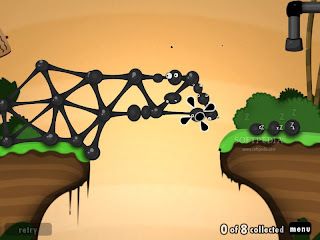 WORLD OF GOO! I love World of Goo! 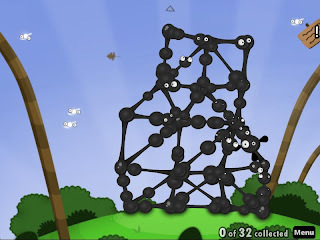 We LOVE World of Goo in this house! That's so awesome!